Bubblemaker is a great way to introduce children to scuba diving in a pool in less than six feet of water. Children who are at least 8 years old get to use scuba gear to breath underwater and have fun swimming around in shallow water! Celebrate a birthday by throwing a memorable, exciting Bubblemaker party with friends and family. It's fun, easy and safe. Youngsters can join in the family fun of scuba diving or even start a trend! Children should be comfortable in the water, but they don't have to be super swimmers. With youngsters in mind, the maximum depth is only 2 meters/ 6 feet. Children use all the basic scuba gear, which is made specifically for their size and stature. Ready to blow bubbles? The Bubblemaker crewpak gives kids a memento of their visit to the underwater world and is full of fun surprises. The pack includes: a kid-sized beach towel, log book, certificate, temporary tattoo emblem and the adorable and popular Bubblemaker "action figure". Adults love them, too. 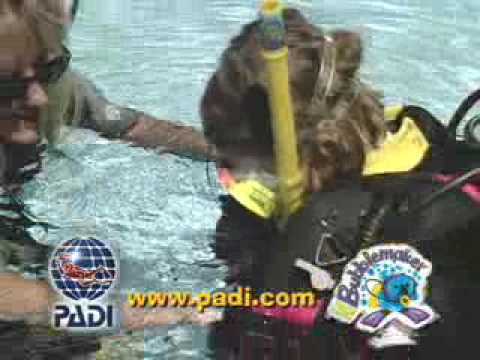 Bubblemakers can continue the adventure and complete AquaMissions with the PADI Seal Team Program. Children who are 10-14 years old can take the PADI Junior Open Water Diver course and may want to pursue other advanced kids courses, such as the PADI Skin Diver Course through Patriot Scuba.